A winning season can be yours with effort and determination, and you'll soon have new friends to make a cheering section. Of course, college has a deeper meaning than a football game. The objectives and decisions made here will influence your life a longer span of time than just four quarters. But the elements that go into teamwork - the skill and precision needed for success - are gained only through faithful training, the competition, and the learned respect for the awe-inducing foe. These are more than surface qualities-and they are all in the game. 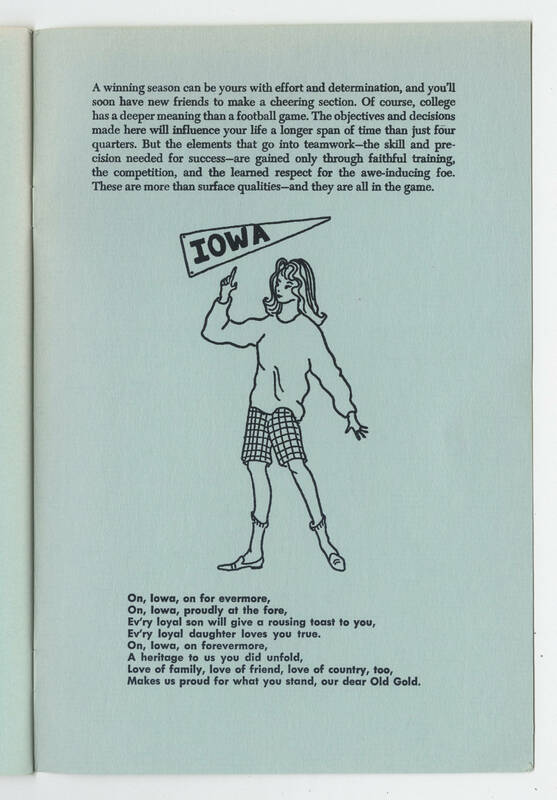 Woman with IOWA pennant On, Iowa, proudly at the fore, On, Iowa, on forevermore, Ev'ry loyal son will give a rousing toast to you, Ev'ry loyal daughter loves you true. On, Iowa, with your wealth untold, A heritage to us you did unfold. Love of family, love of friend, love of country, too. Makes us proud for what you stand, our dear Old Gold.